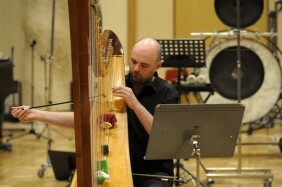 Rhodri Davies plays harp, electric harp, live-electronics and builds wind, water and fire harp installations. His regular groups include a duo with John Butcher, Broken Consort, Common Objects, SLW, Cranc, Portable, Apartment House, The Sealed Knot and a trio with David Toop and Lee Patterson. In 2008 he collaborated with the visual artist Gustav Metzger on ‘Self-Cancellation’, a large-scale audio-visual collaboration in London and Glasgow. He also performs and researches contemporary music. He has commissioned new works for the harp by: Carole Finer, Michael Parsons, Christian Wolff, Ben Patterson, Mieko Shiomi and Yasunao Tone.